One reason this happens is that tutorials give you a neat set of steps rather than the actual process of figuring out those steps on your own. 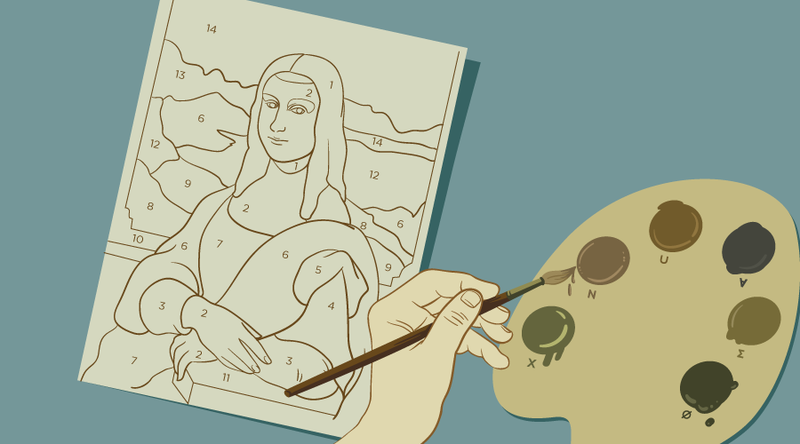 Another reason people struggle with projects is that they compare their intermediate steps with someone else’s finished product and get discouraged. The truth of approaching a project isn’t as neat as the tutorials (mine included) make it seem. The reality is that rather than belting out lines of perfect code, projects are done in small pieces with plenty of trial and error and a healthy dose of searching through reference materials. Important note: As you go through this article, you’ll see some code examples. If any of them seem new or unfamiliar, it’s okay to skim over them for now. The purpose of this article is to have you understand the overall process of approaching a project rather than getting distracted by technical details. Once you’re comfortable with these concepts, you’ll move much faster because you can focus on creating your project instead of worrying about how to write an if statement. A lot of people rush past this step, and everything takes longer as a result. It’s like attempting to play Level 3 of a video game without getting comfortable with the controls back in Level 1. Lots of avoidable frustration. Instead of jumping in and trying to do your project in a series of linear steps, take some time to look at the big picture first. Make a general plan. What sorts of things need to happen? For example, if you’re trying to make a countdown clock, you might need a way to measure time, a place to hold the data, somewhere to display the numbers, and maybe a way to control the clock. At this stage, you don’t want to get bogged down in technical details because you’re still thinking through the general ideas of what you want. As long as you have an overall plan, you’ll have guideposts that will prevent you from getting too badly lost. In software design. this technique is often referred to as a use-case analysis. Now that you have your plan, you’ll want to figure out the details. My favorite way to do this is to write specifically what you want each part of your project to do. The key is to write it not in code but in plain language. (This is called pseudocode.) That way, you can think clearly about what your project is doing without getting distracted by syntax details. Also note that you won’t need to have a perfect series of steps written out at the beginning. This is a fluid process where it’s okay to add things, remove things, get things wrong, learn, and improve. You get a chance to make sure the individual pieces of functionality work before moving on to the next steps. It’s easier to think through what you’re doing when you’re not distracted by too many moving parts at a time. You’ll move faster because you’re not trying to keep track of a million things at once. It’s a lot easier to spot and prevent errors this way. You can experiment and learn as needed. You’ll often end up writing helpful pieces of code you can use elsewhere. With your individual pieces ready, you can start putting your project together. For this stage, the key challenge is to make sure the pieces that worked on their own will still work once they’re connected. This might require some small changes. This method of putting smaller pieces together is much easier than trying to make an entire project all at once because this way, you don’t need to keep track of everything in your head at the same time. Now that we have a function to get the remaining time, we can run the function repeatedly to keep the time display updated. In the above example, we’ve added a showTime function that displays the remaining time on the screen. At the end of the function, we include requestAnimationFrame(showTime), which basically says run showTime again as soon as the browser is ready. This allows us to keep updating the time display in a highly performant manner. You’ll notice the countdown is entirely in milliseconds. The next step will be to convert everything into days, hours, minutes, and seconds. By this point in your project, you will have done plenty of experimenting and testing to make sure everything works. Once it seems to work, see if you can break it. For example, what if the user clicks here or there? What if one of the inputs is unexpected? What if the screen size is narrow? Does everything work in the browsers you expect? Is there a more efficient approach to any part of this project? Note that the reason we used 1000 milliseconds (1 second) in this case is that if we used zero, the clock would overshoot and end up at -1. If your clock is using smaller units than seconds, then make the ending condition smaller than one second. A good friend pointed out this issue as I was working on this article, and it’s just another example of how code might not come out perfect the first time. This leads perfectly into the next point. Getting outside help can be an important step at any point when doing a project. This help can come from reference materials or other people. The reason I bring this up is that there’s a common myth that developers sit down and write perfect code without having to look anything up or ask anyone for advice. I’ve often heard that newer developers are surprised to know how frequently an experienced developer will look things up. In fact, since it’s impossible to know everything, being able to look up information is one of the most valuable skills you can have. Tools and techniques change, but the skill of learning doesn’t go away. Is your code concise and readable? If you have to make a choice between conciseness and readability, you’ll usually want to pick readability unless there’s a huge performance reason. Readability makes your code easier to maintain, update, and fix. Have you used clear naming for your functions and variables? For example a function name like showTime would be much clearer than st. This is important because people often name things thinking they make sense, and then they get lost later because they forgot what their abbreviations meant. A good test for clarity is whether you’d have to explain a name too much to someone who is unfamiliar with the code. Are there any potential naming collisions? For example, are you using names like “container” that are highly likely to be used elsewhere? Are you polluting global scope with too many variables? One easy way to protect global scope is to throw your countdown clock code into an IIFE (immediately-invoked function expression). That way, the clock can access all its variables, but nothing else can. Has the editing process caused any errors? For instance, have you changed a variable name in one place without changing it everywhere else? Have you added something to an object but forgotten to put in an extra comma? Does the output need to be polished? Is your code unnecessarily redundant? Are you repeating code that could be in a function or a loop instead? With reference to the above, we could move the code to add an extra zero to the output into its own function. This reduces duplication and makes things easier to read. Would it help to look at this project with fresh eyes? Try coming back to your code after a few days. With a fresh perspective, you’ll start to see which parts can be made cleaner and more efficient. As you refactor, your code will start to seem more and more elegant. Then you’ll put out the finished product and people will wonder how you wrote such perfect code. A few months later, you’ll look back on it and realize you could have made it so much better. As a friend of mine wisely said, that’s a good thing; it means you’re making progress. See the Pen requestAnimationFrame Countdown by SitePoint (@SitePoint) on CodePen. 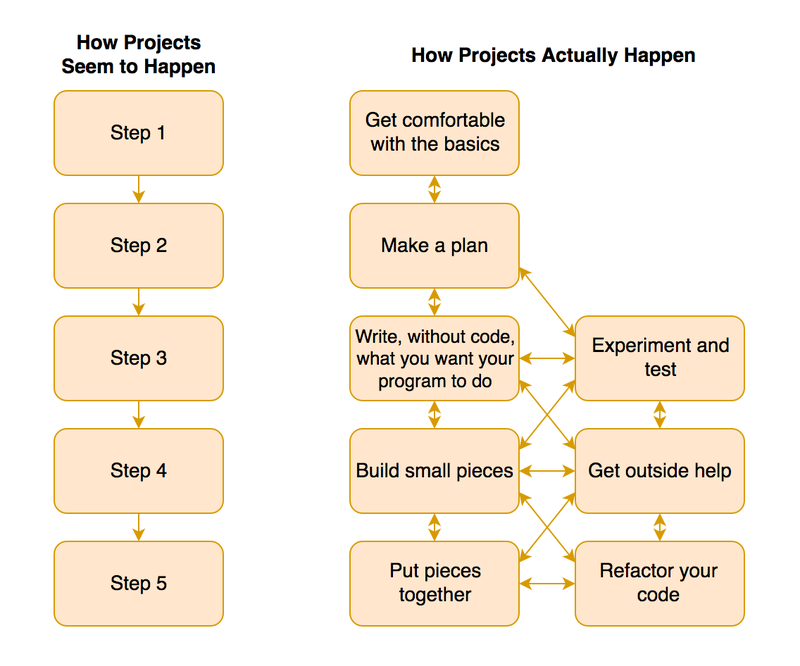 A coding project is rarely a linear process. If there’s one thing I’d like you to take away from this article, it’s that small pieces and experimentation will take you farther than trying to do everything at once. This article was peer reviewed by Vildan Softic and Matt Burnett. Thanks to all of SitePoint’s peer reviewers for making SitePoint content the best it can be!